North Wind has been providing hazardous materials characterization, remediation, and emergency response to the federal, state, and local agencies throughout the western United States for the past 12 years. 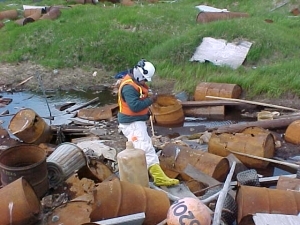 Projects involving hazardous materials have ranged from remediation of wire burn sites, petroleum spills, polychlorinated biphenyl (PCB) spills, drug laboratories, and unknown chemicals on public lands to mine tailings reclamation, repository design and construction, and mine or mill site re-vegetation. North Wind has demonstrated the capability and capacity to mobilize rapidly in response to an emergency hazmat situation and to immediately confine contamination, characterize the site, containerize the spill or hazard, and dispose of contaminants in a cost-effective and safe manner.